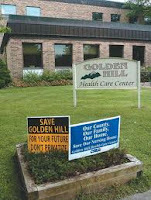 KINGSTON – Ulster County Comptroller Elliott Auerbach Monday urged the county legislature and county executive to appoint members to the board of the Golden Hill Local Development Corporation who are free of governmental control and political influence. “It is vital to the success of this enterprise that its board of directors be free of real or perceived conflicts of interest,” Auerbach said. He said the same problem of independence applies to appointments by the county executive of members of his staff. “When the professional career and personal livelihood of the staff member comes into conflict with the best interests of the GHLDC whose trust does the staff member favor?” he asked. Auerbach noted the state Authorities Budget Office recommends local development board members should be free of direct governmental control and political influence. He said when appointing members to the LDC board, the process used when selecting members to the county Commission on Reapportionment should be followed. In that case, eligible appointees were not public officials or employees and were not confronted with a duality of purpose and confidence, he noted.